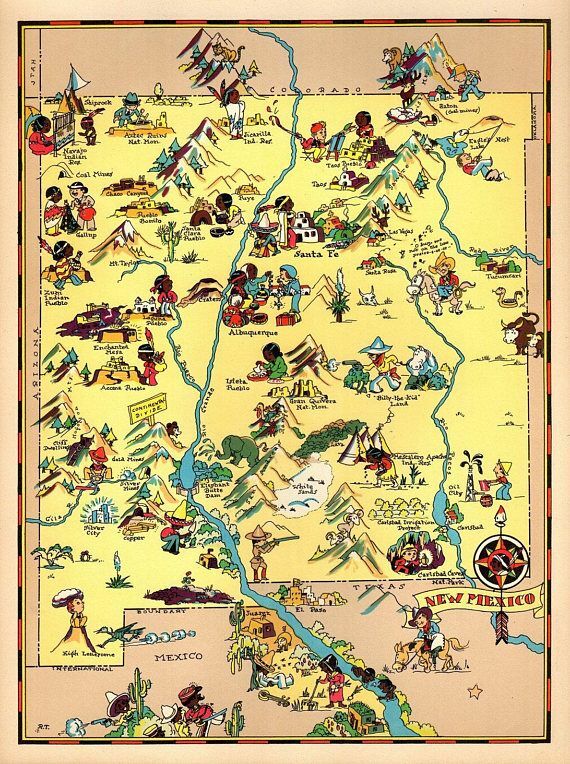 New Deal programs played a profound role in New Mexico from 1933 through 1942. Not only was New Mexico plagued with poverty but it also lacked state agencies capable of delivering social services. The Federal agencies created by the New Deal to stimulate the economy and to alleviate widespread unemployment through work relief projects, forced New Mexico to create agencies in order to receive Federal aid. As a result, the New Deal fundamentally shaped New Mexico state government, confirmed the architectural style of the state governmental buildings, and ushered New Mexico into the 20th century. The widespread absence of well-supported state institutions, agencies, and capital improvements indicates how unprepared New Mexico was for the Great Depression. While usually dated from the 1929 stock market crash to the 1941 preparations for war, the Depression saw New Mexico begin to slide early in the 1920s. Aggregate farm values dropped from $224 million in 1920 to $174 million in 1925 and then plunged in 1930. Livestock values fell from $132 million in 1918 to $61 million by 1929; and taxable properties fell from $403 million in 1920 to $342 million in 1930. Much of the state’s revenue was based on its property tax. Even though the State’s administrators cut budgetary appropriations late in the 1920s, the tax base supporting the remaining governmental functions declined more rapidly than any savings generated by the cuts (Kammer 1994:8). Welsh (1985:20) noted that by the height of the Depression approximately 50 percent of New Mexicans were unemployed and only one percent of the irrigable land was actually under cultivation. Numerous obstacles had to be overcome prior to any initial surveying or subsequent construction of the dam. The remote location and low population density contributed to the rejection of a dam in this vicinity in 1931. A cost estimate of over 11 million dollars to build a dam on the South Canadian River could not be economically justified. A 1933 report, “Unemployment and Destitution in Certain Sections of Texas, Oklahoma, Kansas, Colorado, and New Mexico” well described the conditions of the region during that era (Welsh 1985:23). It was not until 1935 that the use of relief workers under the Emergency Relief Appropriation Act (ERA) made the dam possible to contemplate. In December 1932, Governor Seligman requested $90,000.00 from the Reconstruction Finance Corporation (RFC). In his January 1933, address to the legislature he praised the modesty of his request. Yet by March 1933, fully one-third of the state’s citizens required some form of relief merely to subsist. In the spring of 1933, the RFC provided $465,000.00 in an attempt to mitigate some of the effects of the state’s economic catastrophe. Even as farm prices dropped and farm foreclosures spread in eastern New Mexico, Seligman’s plan to fight the Depression was economic restraint. The unrealistic approach of New Mexico’s government left the state completely unprepared to deal with the ramifications of the Depression. With the statewide and national economic collapse and the inability of the New Mexico’s leadership to develop meaningful relief programs the ensuing response forever changed the structure, and character of New Mexico’s government. This involvement with the WPA programs was facilitated by the interaction between President Franklin D. Roosevelt and Governor Clyde Tingley (Kammer 1994:14-17). With the economic justification provided by the use of relief workers, the Corps of Engineers was now poised to return to New Mexico. There were, however, two major problems, which had to be overcome: monetary and bureaucratic. New Mexico had no money for its share of the project cost and the legislature would not meet for eight months (early 1936). Additionally, Harold Ickes, director of the Public Works Administration (PWA), did not believe in the economic viability of the Conchas Dam. Elected as governor in November 1934, Clyde Tingley, a consummate New Deal Democrat, embraced the Conchas Dam project and pledged his support to request any amount of funds from the State Legislature. In May 1935, Tingley learned $54,000.00 was the price to purchase right-of way from absentee owners of the 40-square mile Bell Ranch for the dam’s construction. On July 23, 1935, the PWA recommended Conchas Dam for construction, and the Emergency Relief Act was signed on August 1. During this time, Tingley had conducted an elaborate scheme to acquire federal funds by speaking on behalf of the Legislature and the Bell Ranch without the knowledge of either party. Tingley had promised Washington that New Mexico would purchase right-of-way while attempting to convince the ranch owners to accept a good faith 90-day note without payment. Captain Hans Kramer threatened to withdraw federal support when he learned of the situation, and the manager of the Bell Ranch let it be known that, “the governor is in quite a jamb…” (Welsh 1985:20-25). Since Tingley began going door to door to raise the necessary funds, the ranch manager permitted the Corps to conduct the test drilling for a suitable dam location but would not allow construction of any permanent buildings. 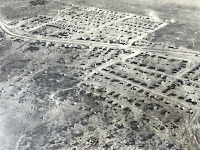 (Corps of Engineers personnel were living out of tents and or traveling back and forth from Tucumcari). Discussions between Kramer and Tingley resulted in a condemnation suit for 1,100 acres of the Bell Ranch for the dam, town site, and road easements. The state had no legal authority to initiate condemnation proceedings because an impasse had not yet been reached. The Bell Ranch was trapped in an awkward position due to the “fever heat” gripping the populace at the prospect of employment (Welsh 1985:26). The ranch owners mounted legal challenges to protect their position, and during this period the local businessman and water commissioner Arch Hurley of Tucumcari, suggested to the ranch owners that they pressure the Corps to provide water and free electricity to pump it to 3,000 highland acres in exchange for 17,000 acres for the dam. All the while, Tingley was attempting to raise $100,000.00; the Corps believed $234,000.00 to be a more appropriate sum. Harold Ickes had always been suspicious of the motives of New Mexico’s politicians. He confided to Bell Ranch officials that he released the Conchas funding early in order to force New Mexico’s elected officials to acquire their share of the costs or lose the project. In early October 1935, Tingley learned that the Corps would abandon the project if the right-of-way money was not raised by October 22. Tingley’s corporate sponsors began to lose interest upon learning that no private concessions would be permitted at the construction site and the low wage scale would preclude commercial activity in the area. Given the increasingly bleak prospects for Conchas Dam, Tingley chose an even more direct course of action and took the train to the dedication of Boulder Dam on the Colorado River. There he met with his friend President Roosevelt for more than an hour in the latter’s private railroad car. The meeting resulted in Roosevelt’s support for federal purchase of the right-of-way with the understanding that New Mexico’s legislature would buy it in January 1936. Tingley continued to raise money for the state’s share. Arch Hurley, an influential farmer from Tucumcari, compounded the difficulties by breaching the confidentiality of the Roosevelt-Tingley agreement to Amarillo business leaders. Bell Ranch owners assumed that Hurley acted in an official capacity when he suggested irrigating the highlands, and so in September 1935 they offered the deal to the federal government. As Tingley knew nothing about this he was shocked when contacted by a questioning federal employee. Almost at the same time, the state was prepared to claim the dam site through the condemnation suit but decided that 34,000 acres would be required to include a lake and public park. The Bell Ranch threatened a second counter suit and the Chief of the Corps of Engineers demanded a resolution by November 12, 1935. On November 1, 1935, Bell Ranch owners surprised everyone with an offer of a complete settlement in exchange for water conveyed through a four-inch pipe, and for the first time, set a purchase price ($165,000.00). Three days later the New Mexico Supreme Court officially and publicly pronounced a verdict of dismissal, with prejudice, of the Bell Ranch lawsuit. On November 13, 1935, all parties signed all agreements and Captain Hans Kramer was granted permission to enter all land associated with the dam site. President Franklin D. Roosevelt approved the Conchas Dam project on July 29, 1935 as part of the Works Relief Program under the Emergency Relief Appropriation Act of 1935. Congress adopted it in the Flood Control Act of 1936 to provide flood control, irrigation, and municipal water supply benefits. The undertaking involved nearly every New Deal program created by the Roosevelt. 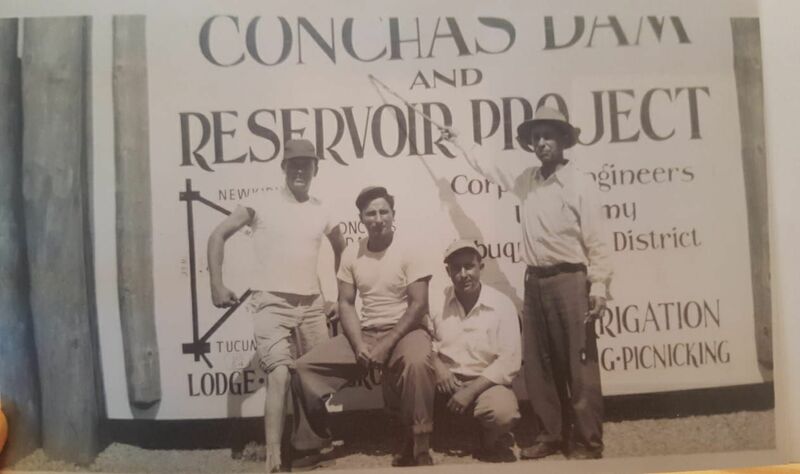 Both the Works Progress Administration and the Public Works Administration (PWA) were involved with the construction of Conchas Dam, while the CCC built the Permanent Housing and Administration Building and park. The Conchas Dam project was specifically justified as a means to bring wage-paying jobs to an area of high unemployment. As soon as the protracted negotiations for rights-of-entry and land acquisition were completed, people were put to work on the access road to the site from the railhead at Newkirk. Initially hand tools such as shovels, sledgehammers, pry bars, and horse-drawn fresnoes were used as no larger mechanical equipment was available. As example, rock for the South Dike was all placed by hand and several access roads were dug with picks and shovels. The use of labor-intensive adobe construction compensated for the lack of skilled workers who were, however, skilled in the manufacture and use of adobes. This also compensated for both the lack of standard building material then available in New Mexico and the high transportation cost that would have been involved in bringing this material to this remote location. As construction intensified on the dam, mechanized equipment was used in abundance; however, men with shovels were still employed in order to lessen the relief rolls. Captain Hans Kramer, District Engineer, instituted training programs throughout the four years of construction. Initially there were so few skilled workers in New Mexico that the private contractors engaged in various portions of the dam were required to bring in skilled personnel from as far away as California and the Midwest. This resulted in a certain amount of resentment and conflict between the locals and the outsiders. However, the poverty of New Mexico was such that there was never a lack of people seeking work, in spite of the low wages for the unskilled ($.25 per hour) and limits of 20 hours per week (so that even more people could be hired). The logistics accompanying such a large construction project as Conchas Dam were staggering. In addition to a complex dam, an entire town had to be created in the middle of nowhere in a sparsely populated state. There were also unanticipated consequences, which caused difficulties in other parts of the state. For example, the great demand for workers at the PWA’s Conchas Dam project forced WPA administrators to assign many individuals on work relief in Union County to jobs at the dam site. This in turn caused the WPA district office in Raton to suspend WPA projects in Union County because of the lack of additional personnel and the priority of federal agencies and private interests over the WPA use of relief workers (Kammer 1994:64). 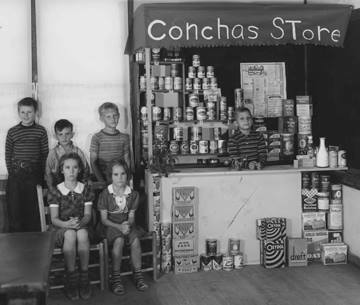 The first employment peak occurred during the creation of the construction town, Conchas City, in the summer of 1936. This major undertaking relied almost exclusively on relief laborers from New Mexico and the Texas Panhandle. 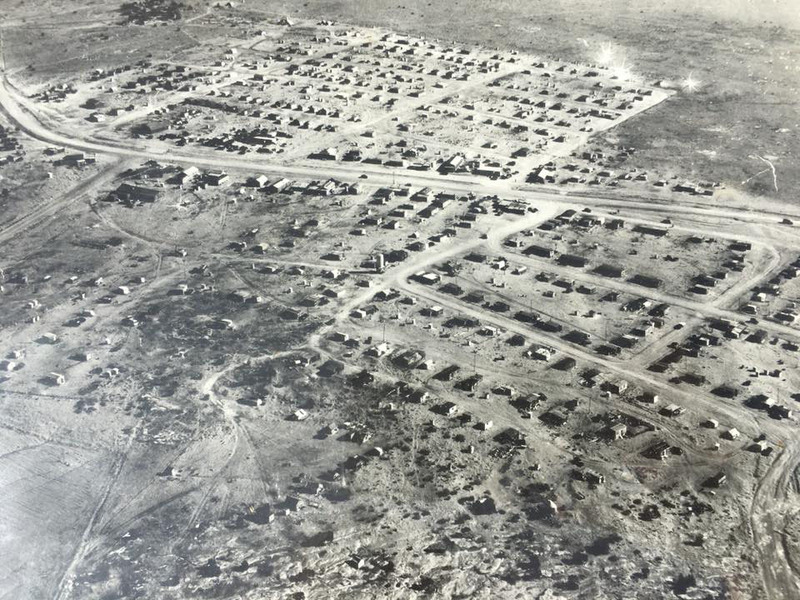 Construction of the town began in the winter of 1935, and by the time it was completed in the summer of 1936, over 2,500 relief workers had been involved at a cost of $1.5 million dollars. Over 745,000 adobe bricks were manufactured for use in the buildings of the construction town. In order to prevent breakage, the bricks were loaded, unloaded, and stacked by hand. Production of the bricks began on August 15, 1935, and in the first three months 5,600 adobe bricks were made. In addition to the 745,266 adobe bricks, 216,850 cubic feet of sandstone was excavated for constriction. The result was 50 adobe buildings, 29 stone buildings, and one combination of adobe and stone completed at a cost of $0.19 per cubic foot. These buildings provided dormitory quarters for 1,320 men and apartment residences for 141 families (Adobe Brick Reports 1937; Kramer 1940:60-63, and 1941:355-362; Foote 1937:265-268). 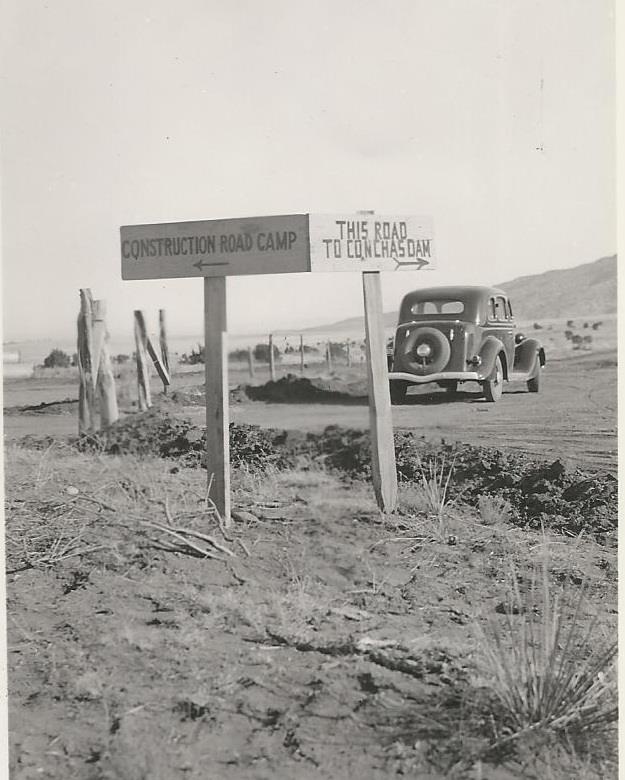 By late August 1936, an entire town characterized by wide gravel streets and buildings of typical Southwestern architecture was created to support the construction project. The construction also included roads, gas and power lines, sewage system and power plant. In addition to the 36 dormitories and 132 individual houses and duplex apartments, the site included a mess hall capable of feeding 1,500 employees; an administration building; a 24-bed modern hospital; a filling station; a business building, which housed a drug store, a restaurant, a dry cleaning and tailor shop, a barber shop, a pool hall, a grocery store, and a beauty parlor; a town hall which also contained the post office, a service building; a guest house; and a concrete and soils laboratory. 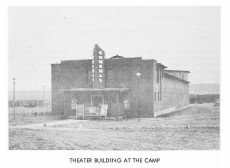 Following the major construction effort a movie theater capable of seating 700 patrons, three 8-car garages, nine single houses, one quadruplex apartment, and a Catholic church were added. Because of the unsuitably high saline content of the well water, four water storage tanks, each with a capacity of 2,200,000 gallons, and a complete water purification plant were constructed. At its height, the construction town’s population was slightly over 1,800. A town manager supervised the town’s administration; a five-person police force and a 30-member volunteer fire department were maintained. Telephone, telegraph and mail service were provided. Recreational opportunities for workers and students included baseball, softball, golf, swimming, tennis, volleyball, basketball and dances. With the many families living at the construction town, it became necessary to provide for the education of the school age children. The 120-mile daily round trip to Tucumcari, the nearest town, was considered too arduous for the younger children. Captain Kramer and others secured WPA funds for the employment of three grade school teachers for the 1936-1937 academic year. Those old enough to attend high school traveled to Tucumcari. For the following academic years, the New Mexico Board of Education established grade schools and high schools at the construction site (average enrollment each year of 50 in grammar school and 100 in high school). Originally the town was to be demolished and the salvaged materials sold to other Corps Districts or other government agencies. While there was growing interest in the development of recreational facilities by the State, recreation was not among the War Department’s authorities. Therefore, the Engineer Department of the Corps cooperated in interesting the proper agencies in such an undertaking. The result of this collaboration was an agreement with the National Park Service (NPS) to occupy and maintain portions of the camp until they could construct suitable recreation facilities on lands and waters provided by the Corps. The recreation area was located on the opposite side of the lake from the dam. After that time the CCC, under NPS direction, undertook the demolition of the town, the recycled the materials to build the Corps’ Permanent Housing and Administration Building. Given the small number of New Mexico’s government-sponsored capital improvements, the number of projects completed through New Deal programs is nothing short of profound. New Mexico ranked fifth among all states, behind Nevada, Montana, Wyoming, and Arizona, in per capita expenditure of New Deal money from 1933-1939. Contrasted with the 294 federal and nonfederal PWA projects in New Mexico are the almost 4,000 WPA projects divided essentially equally into two categories, service and engineering or construction. The 64.3 million dollars spent on WPA projects in New Mexico made dramatic changes in public capital improvements. The Conchas Dam Historic District is a centerpiece of the New Deal’s legacy in New Mexico. Essay taken from "Conchas Dam Historic District", National Register of Historic Places, September 2004. Cohea, Carol. “Paintings Escape Obscurity,” Albuquerque Journal (March 21, 1976). Albuquerque. Culter, Phoebe. The Public Landscape of the New Deal. Yale University Press, 1985. Foote, L.H. 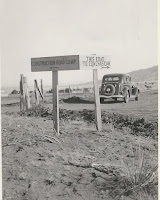 "Conchas Dam Construction Camp," The Military Engineer. Vol. XXIX, No. 166. On file. Corps of Engineers, Albuquerque District, Albuquerque, NM. Kammer, David. The Historic and Architectural Resources of the New Deal in New Mexico. On file. New Mexico Historic Preservation Division, Santa Fe, NM, 1994. Kramer, Hans. History of Conchas Dam and Reservoir Project. On file. IM-S Historical File, Corps of Engineers Albuquerque District, Albuquerque, NM, 1940. Design and Construction of Conchas Dam, New Mexico. Two volumes. On file. IM-S Historical File, Corps of Engineers, Albuquerque District, Albuquerque, NM, 1941. U.S. Army Corps of Engineers. “Circular No. 321” On file, IM-S Historical File. Albuquerque, NM, 1931. Adobe Brick Reports. Part I, Report of Tests. Part II, Building Construction. On file, Records Holding, 228-10; Box M7-9-1. Albuquerque, NM, 1937. Specifications: Permanent Facilities. On file. Albuquerque, NM, 1939. Information Pamphlet on Conchas Dam and Reservoir Project, South Canadian River, New Mexico. On file, IM-S Historical File Albuquerque, NM, 1948. Master Plan, Conchas Dam. On file. Albuquerque, NM, 1976.1976 Welsh, Michael E. A Mission in the Desert. On file. Corps of Engineers, Albuquerque District, Albuquerque, NM, 1985.